One of our Agency clients approached us to produce a brochure finished to a non-standard shape. Additionally, the front was to have a spot UV varnish to highlight the main image. 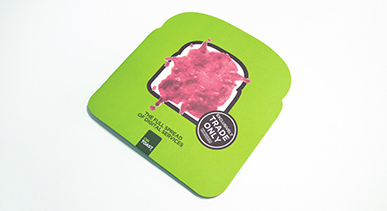 Complementing this brochure, we were asked to produce letterheads & business cards with a matching, toast shape profile. Having reviewed the full remit, we were able to make a number of suggestions as to how the brief could be best fulfilled. Traditional die cutting techniques would have been inappropriate for this project. If we had simply die cut the flat unbound sheets prior to stitching, the 9 separate inner spreads would have crept out of synchronisation when folded giving an uneven look. The solution we offered for this problem was to produce a square book and Ram Punch the outer profile. Ram punching is a specialist process designed to overcome creep problems of this nature. As this brochure had been specified on Uncoated stock we advised that a clear foil should be used as a substitute to the spot UV varnish as this would give us a superior result on this type of paper. The business cards were similarly foiled to the face and die cut along with the letterhead in the traditional way. Many years of print & finishing experience and having close ongoing partnerships with our clients’ results in a high quality, cost effective solution to a diverse array of printing challenges. There is nothing the Kolorco team likes more than a challenge. We have a wealth of experience which we want to share with you. For more information on this project and many more please call one of our team on 01274 613566.